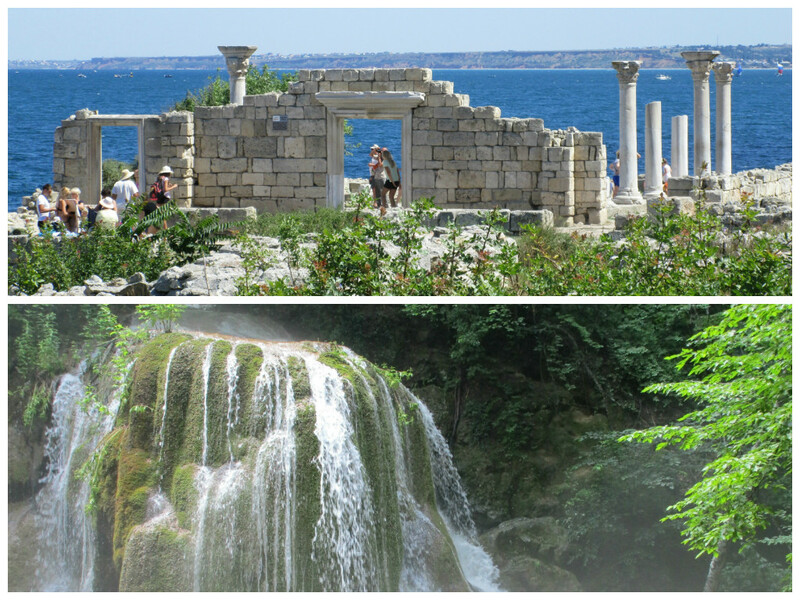 I spent July back in Sevastopol after nearly a year away. So what changes have there been? And do people still believe they made the right choice at the referendum and they are better off in Russia? The most striking change for me was how busy the city is now. There are a lot more people and traffic jams are much more common. 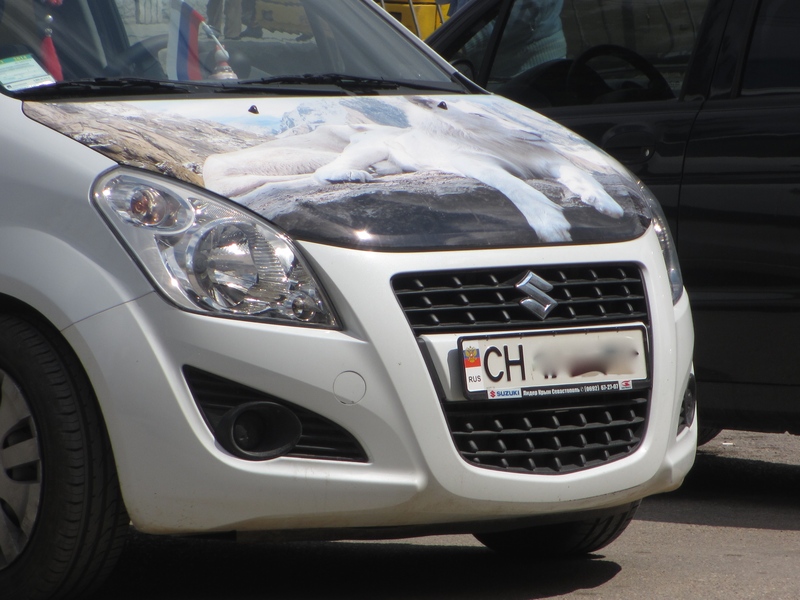 At least half of the number plates are Russian, and they come from a wide variety of regions. 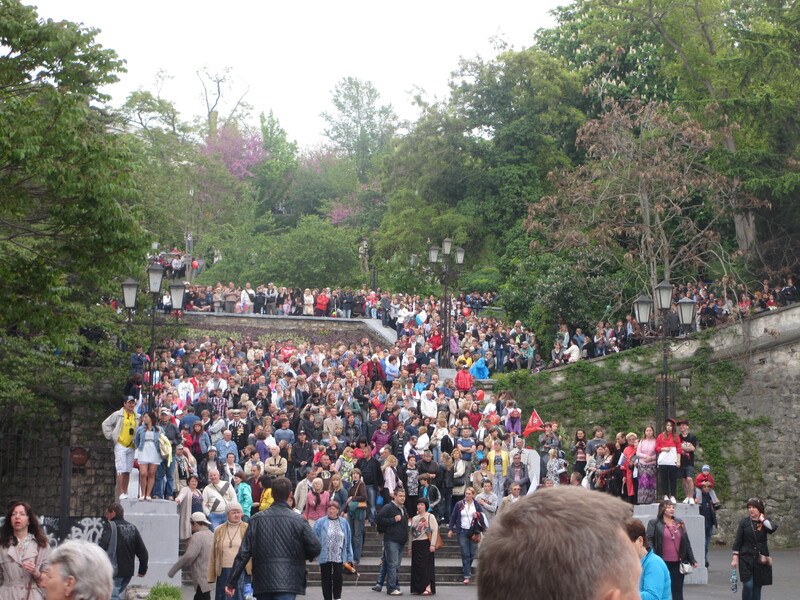 When I first arrived in Sevastopol I think the population was about 500,000. On this trip, I was told that it’s grown to about one million, although nobody is really sure. A lot of the difference in numbers is due to refugees from Donetsk and other parts of Eastern Ukraine. It was also the peak of the holiday season when I was there. Flights from Simferopol airport are constantly booked up, with people arriving from all over Russia, plus other former Soviet states like Kazakhstan. This means it’s now very difficult to find accommodation in the city and the price of rent has risen considerably. The rest of the changes I found out about were less obvious. There now seems to be some recognition in the outside world that Crimea is no longer part of Ukraine, although not yet that it is part of Russia. When I visited Skyscanner to book a flight, Crimea was listed as a separate place in the country list. I found it interesting that it was listed in Roman characters on the Ukrainian list, rather than in Cyrillic, and wonder what prompted that decision. 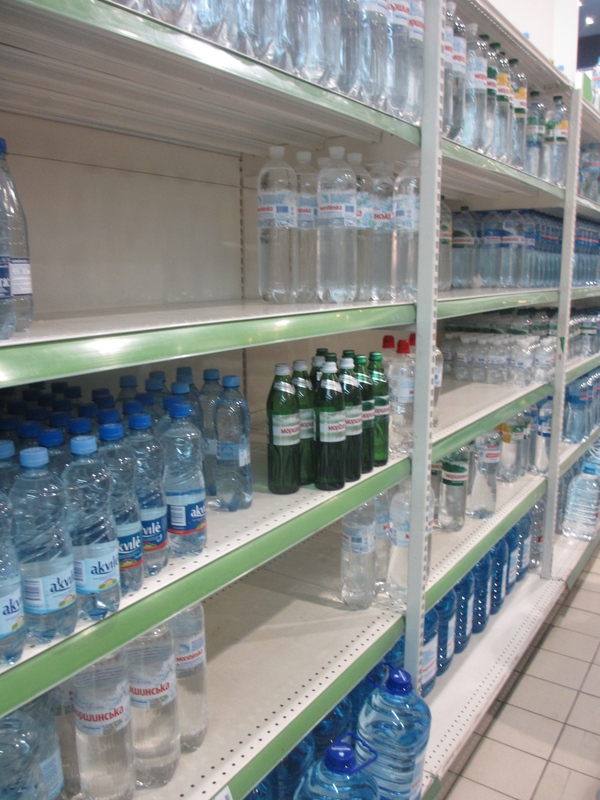 Sanctions have not had as much of an effect on commerce as I expected, as you can still buy many ‘Western’ products, like Mars bars, Bonaqua water, Laughing Cow and mascarpone. However, the majority of these are actually produced in former Soviet states, which is why they have slipped through the net. They have affected my friends in other ways though. Those who have opted for a Russian international passport* can no longer get a Shengen visa, meaning they cannot easily travel to or work in Europe. The only way to get around this is if the address your passport is registered to is outside Crimea, for example in Moscow or Saint Petersburg. 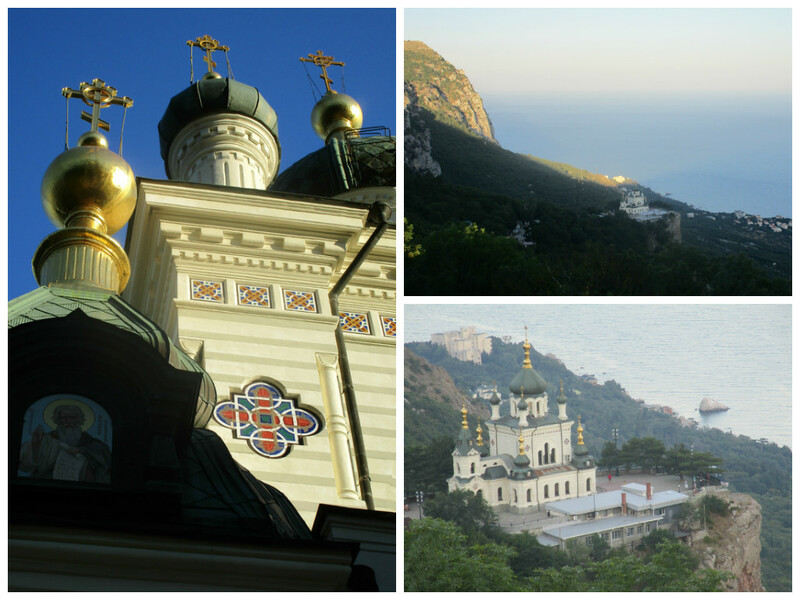 It used to be possible to get Shengen visas without leaving Crimea, but this is no longer possible. Even if you have a Ukrainian international passport, you still need to have a Russian local passport to meet the requirements of daily life in Crimea as far as I know. If you cross the land border from Crimea to Ukraine and the Ukrainian border guards find that you have a Russian passport, they can fine you heavily (about £500 if I remember rightly), remove the passport and destroy it. 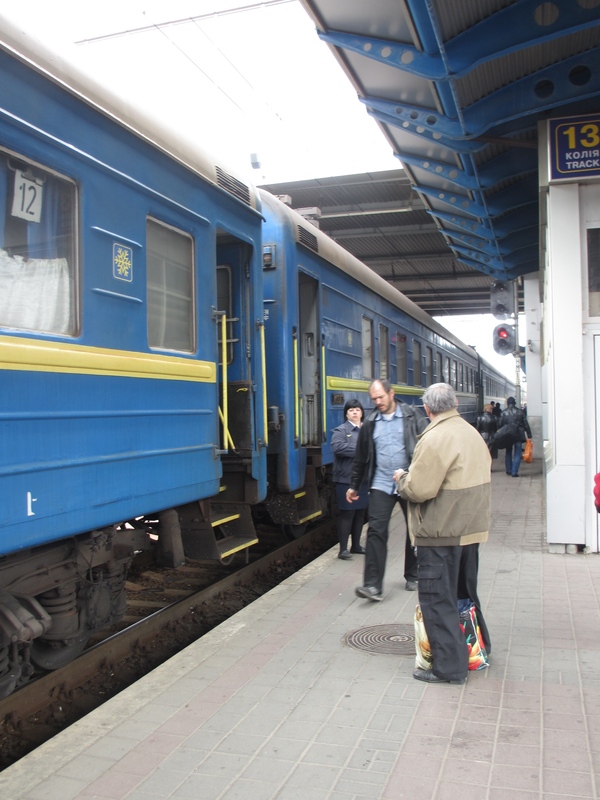 This means that most people now travel via mainland Russia rather than crossing the land border (though it is still used). That adds another layer of complication for those with Ukrainian passports, since they require a Russian entry visa to come back into Crimea. This is only valid for 90 days. I’m not really sure what happens if they overstay that period. While we’re on this topic, the only area in which people said it was better being in Ukraine was the bureaucracy. 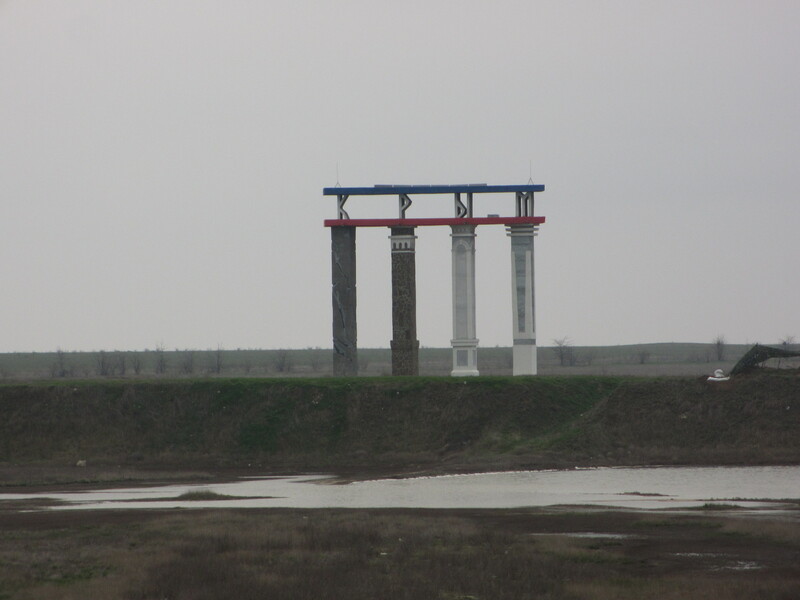 Although it was long-winded, Russian systems tend to be even more complicated. There is also the added problem that Crimean officials are still trying to get their heads around the Russian systems, and don’t always know how they are expected to do things in their new country. One positive change I noticed was that money seems to be flowing more freely than when I left in August last year. At that time, one or two cash machines were starting to work, but it was still largely a cash economy. From what I could tell, most cash machines seem to be functioning normally now, and card machines in shops are also back in use. 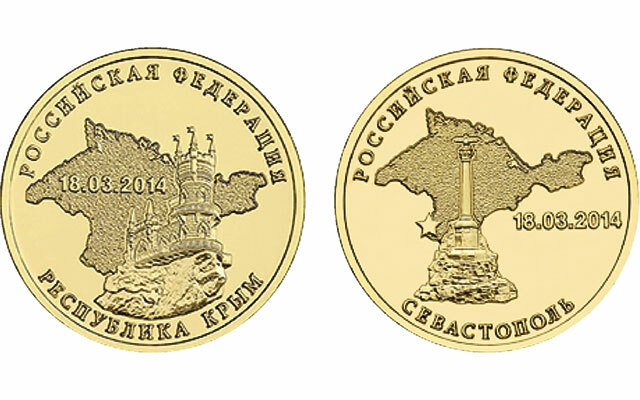 There is now a Russian 10 rouble coin featuring Sevastopol, and another featuring the Swallow’s Nest in Yalta. Having said that, not all of the money from the Russian government is making it to where it should. 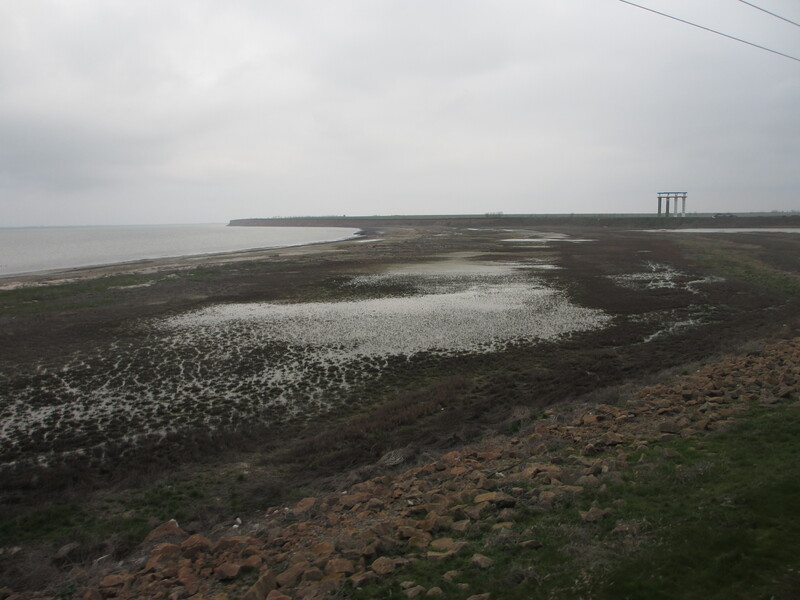 One person told me that Sevastopol was given $5 million to repair the roads in the city centre ready for the 9th May Victory Day celebrations, but there was no evidence of any repair when I was there in July. Apparently the money ‘disappeared’. Overall, everyone I asked said that they still believe they made the right decision in the referendum to leave Ukraine and join Russia. However, some of the optimism has worn off a little, as their high expectations have not been met. While there have been some improvements in their lives, there is still a long way to go before life becomes free and easy again. *In Russian, the word ‘passport’ is used to describe both the local/national identity document and the one used to travel internationally, hence the distinction here. 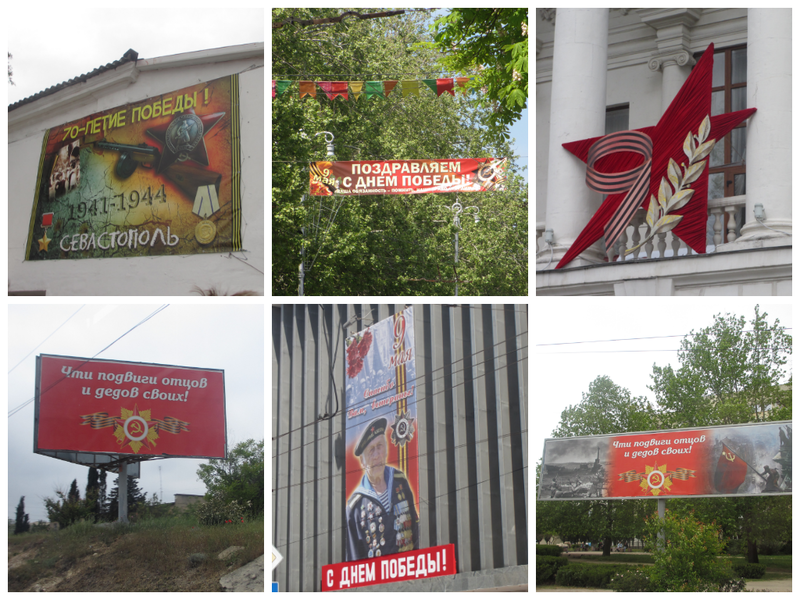 This is part of a series of posts I’ve been writing about the situation in Sevastopol/Crimea, where I currently live. I’m hoping to show what life is really like here. Having said that, the transition from hryvnia to rouble went a lot more smoothly than expected, considering the haste with which is was done. The week before and the week after June 1st were both quite stressful for anyone who had to deal with money. 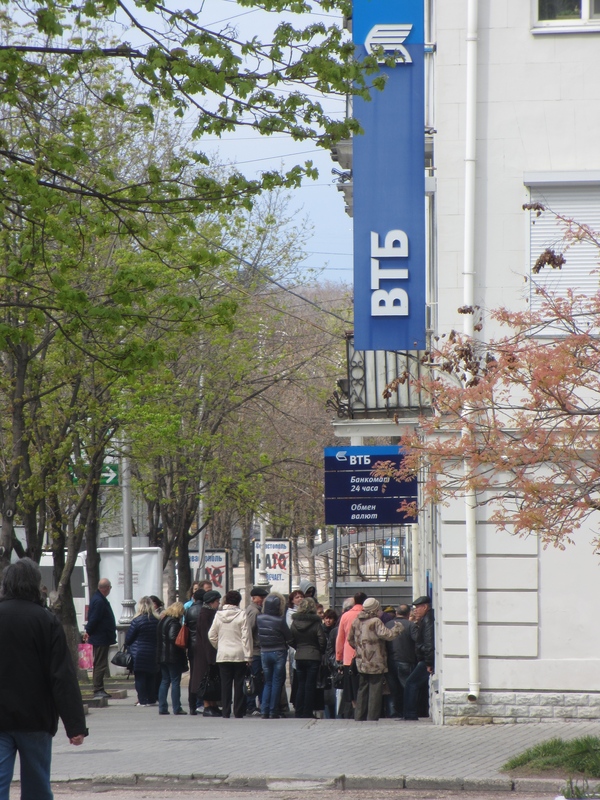 Before the changeover transactions were taking a very long time because people were trying to get rid of hryvnia or paying in a combination of both currencies. 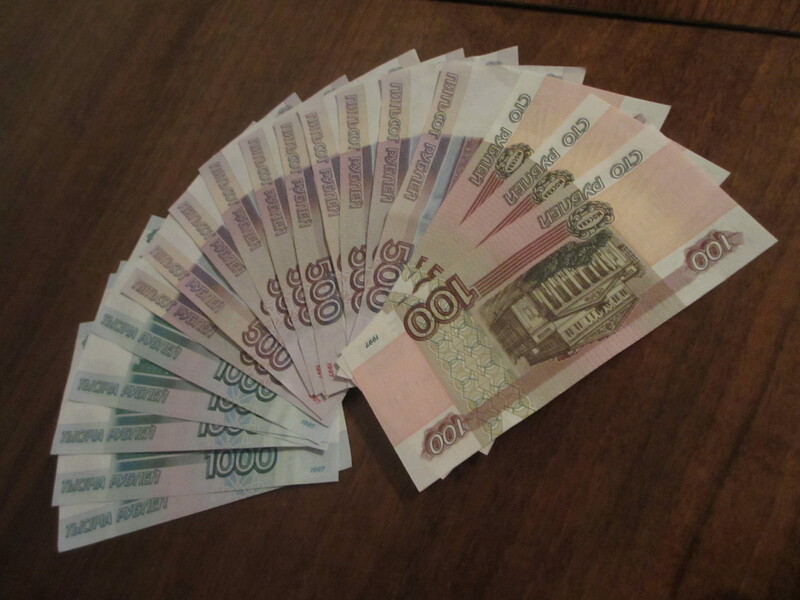 Most people only had large notes in roubles, making giving change very difficult. One evening I waited for over twenty minutes in a supermarket queue – there were two tills open, each with at least fifteen people in the queue, and every transaction took three to five minutes because of money problems. There was also the problem of getting used to the currency itself – although there are many people who are Russian or have lived in Russia here, and have therefore used the rouble, it’s a different thing for everyone to be dealing with it on a daily basis. I saw a pharmacist and customer getting increasingly irate with each other because they couldn’t work out the correct combination of notes/coins that would enable the customer to get the right change. It’s hard to believe that was still the case only two weeks ago: it now feels like roubles are completely normal, and there don’t seem to any problems with the circulation of cash at all, or at least not that I can tell. Cards are still a problem, and I don’t think anywhere has got their card readers working yet, so the local economy is still entirely cash-based, but rumours are circulating about banks which are issuing Visa cards, so I imagine that will change before too long too. 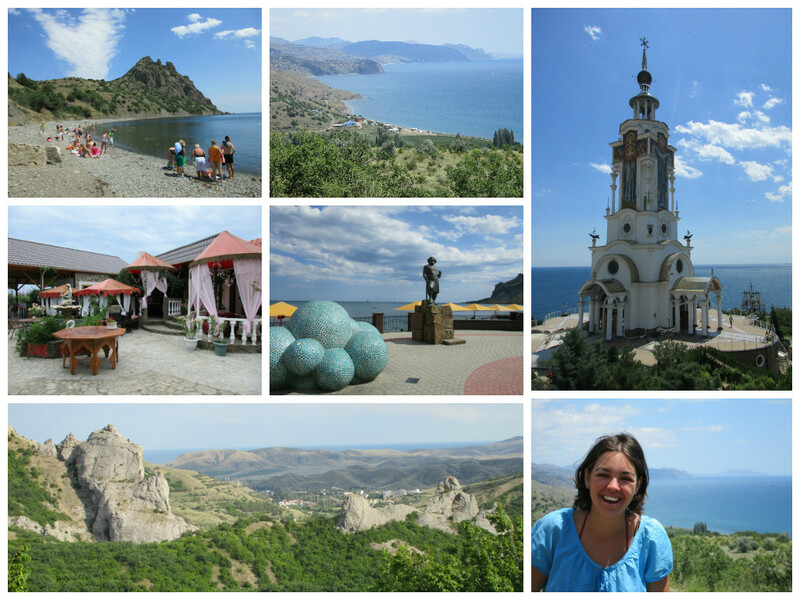 Tourism was one of the issues I talked about when speculating on the future for Crimea in the aftermath of the referendum. 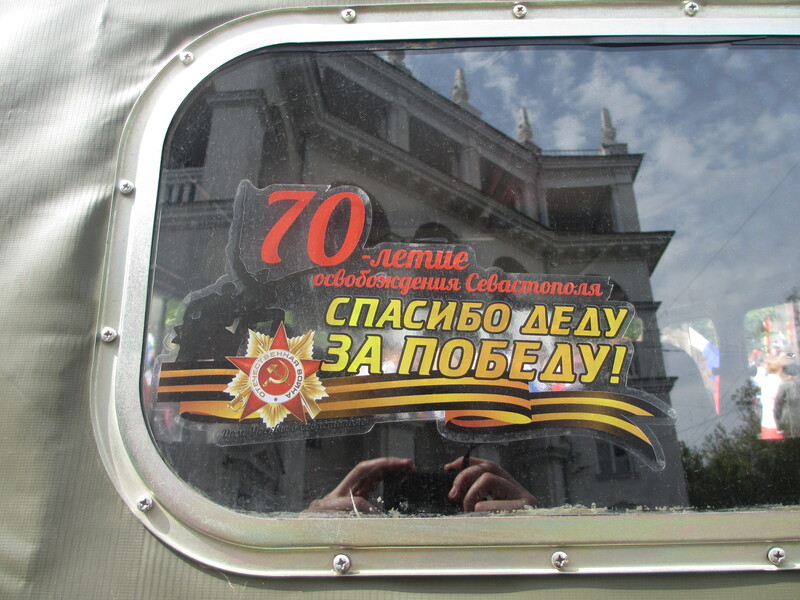 The tourist season is now here, and I know that there are people visiting as I’ve seen them on the buses, and number plates from Belorussia and Lithuania, among other places, are more visible. We also have some Russian students who have come to Sevastopol to spend the summer here, as they do every year. 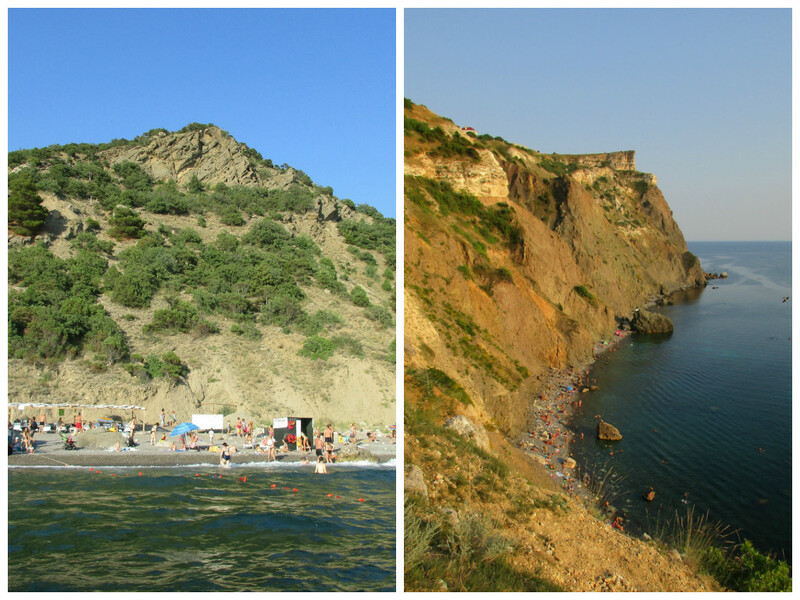 The weather has mostly been great, and there are lots of people on the beaches. Simferopol airport is very busy again, although I don’t know how this compares to previous years. Flights are planned to at least five different countries in my quick scan of their schedule. Apparently a lot of the flights are already booked, and it’s difficult to find free seats. I’m not sure if that’s in both directions (i.e. 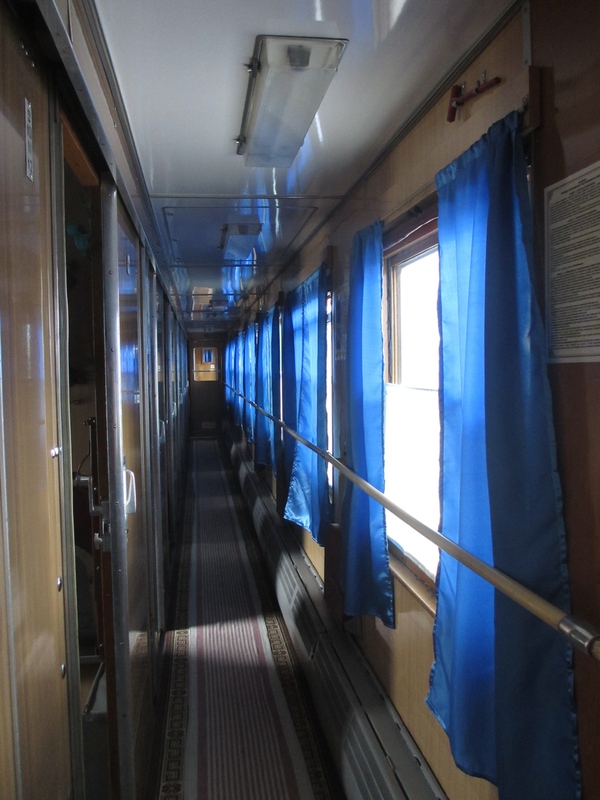 into and out of Crimea), but either way I think that’s a positive thing as it means people are being able to move relatively freely. I know that post is getting through, as one of my students has had seven or eight postcrossing cards in the last three weeks. Unfortunately, I still haven’t had any post since the end of March, except for one postcard for my students. I’m hoping that I’ll get it all at some point, since I’m expecting (at the minimum) one letter and about 12 postcrossing cards. 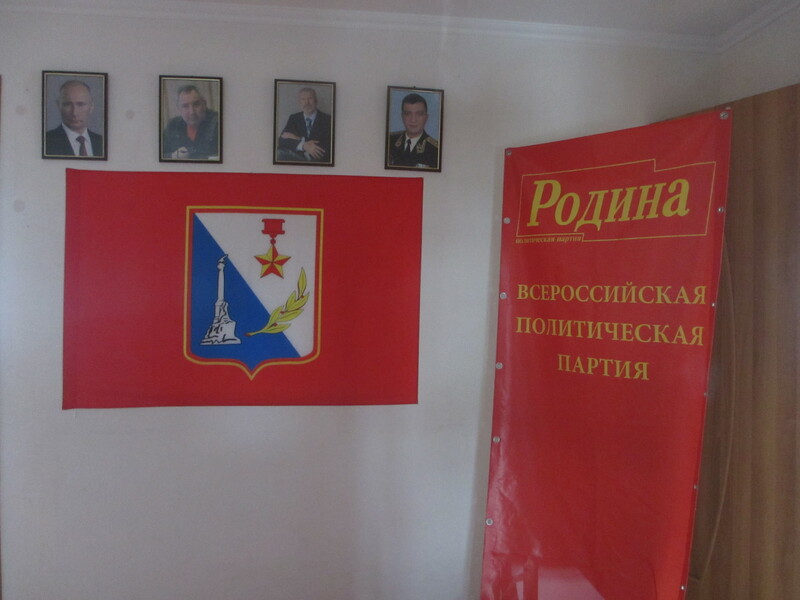 Russian political parties are very much present, with many new offices having opened in Sevastopol. There’ll be an election in the autumn, I believe. Cars with loudspeakers regularly pass, at least one or two a week, with students tuning in briefly, then dismissing them with ‘politics’. There are billboards advertising all of the parties, including the Communist party, which I have to admit causes me to do a double-take every time I see one. 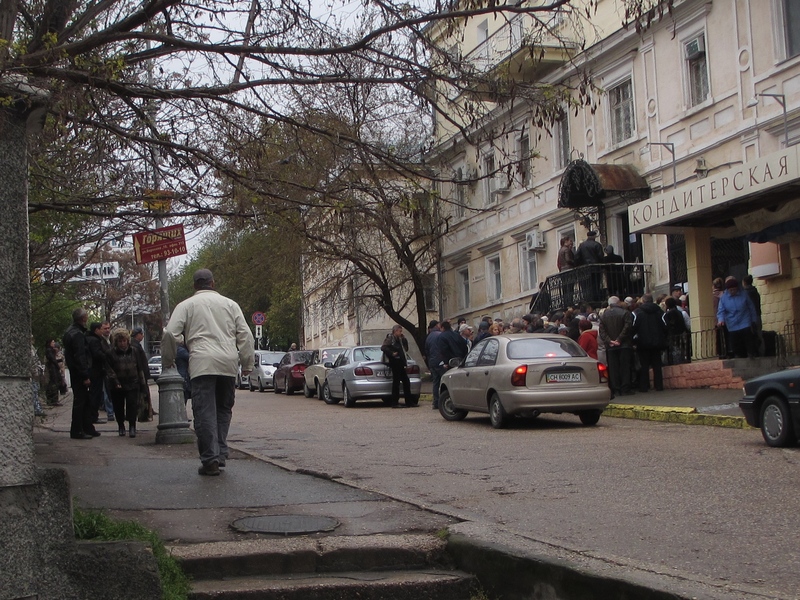 The offices below the school are occupied by a party called Родина. They replaced the Ukrainian Батьківщина party, and apparently the name of both parties translates to almost the same English word, the former being ‘motherland’ and the latter being ‘fatherland’! I’ve been told that all of the universities in Sevastopol have been combined into a single organisation now, but don’t know the name or any more details about it. (Sorry!) I don’t know what that will mean for the students at the universities, and how that will affect them going forward. Other organisations have become Russian too: the shop nearest the school, which I thought had been closed, was instead renovated and reopened as a Russian local store. 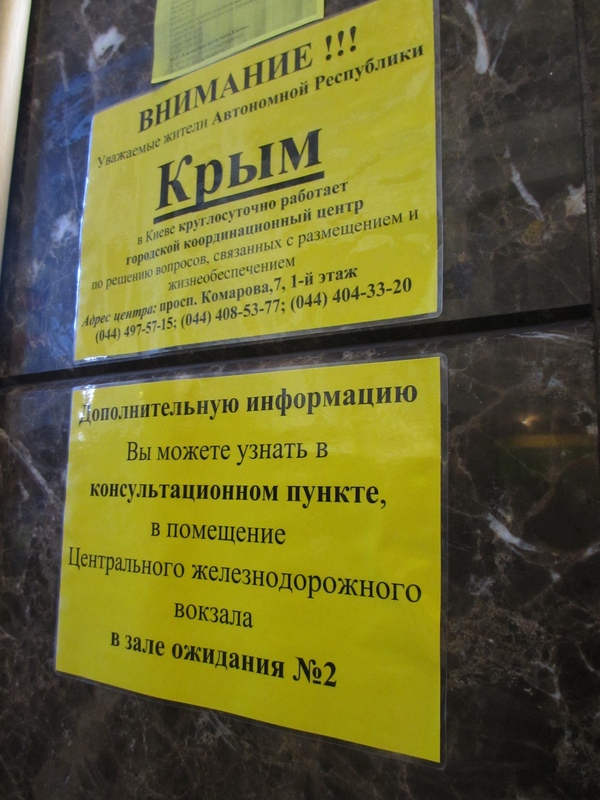 As far as I know, all businesses in Crimea need to be registered in Russia by the beginning of next year, which is a complicated process because (as with most things during the changeover) nobody quite knows how to do it, and many records are being held in Kiev and not released. 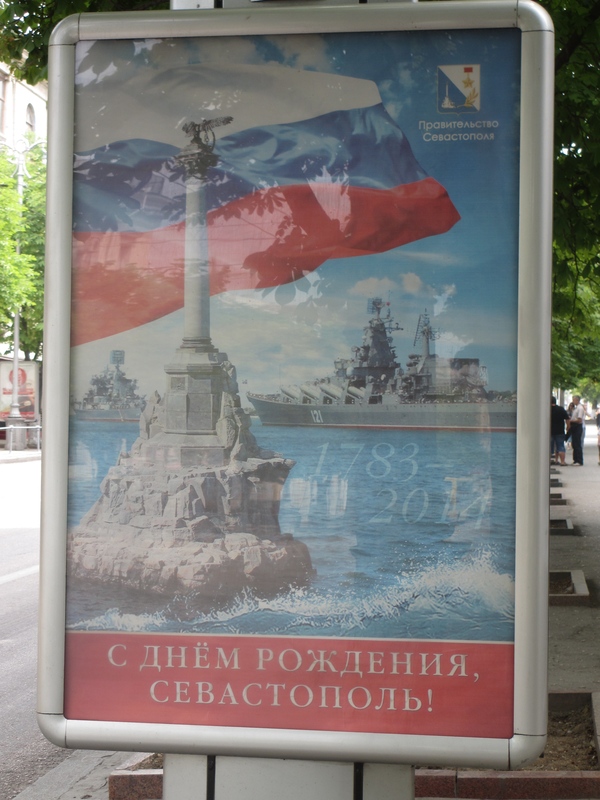 June 14th saw the 231st birthday of Sevastopol, two days after Russia Day, a national holiday. 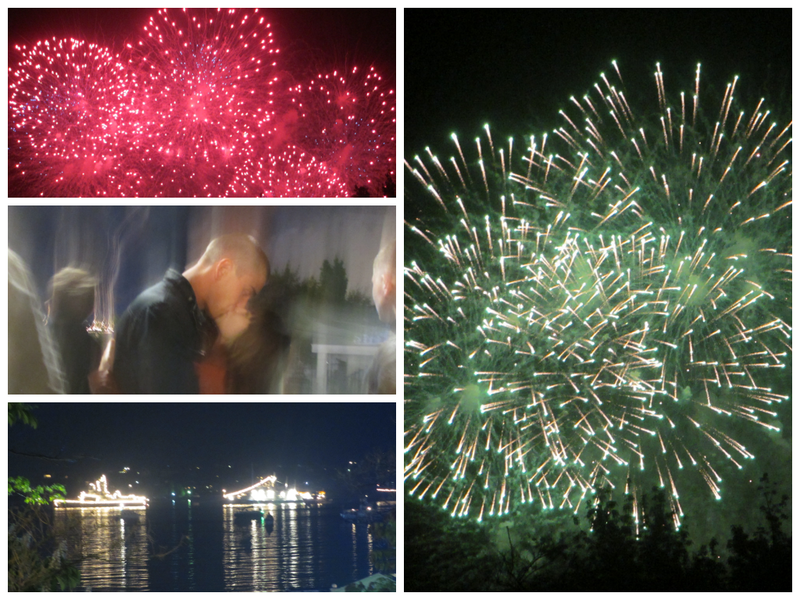 There were parades, concerts and fireworks for the weekend, but I was on a roll working and decided not to go. Clearly I regret that now, but it seemed like a good idea at the time. One student told me that the concert on the 14th included a choir of hundreds of children who had sung at the Sochi Opening Ceremony, bussed in from Russia specially for the birthday celebrations. As for the people here, there are still at least two pro-Ukrainians I know who are planning to leave, but there is no sense of urgency to it – they will leave when all of their plans are in place, but are enjoying their lives in the meantime. The Tatars are just as present as they always were, as far as I can tell, with no particular changes to how they’re living their lives. We had Tatar students taking exams at the school, and one of my students is half Tatar. I think that the fears about how Tatars and Ukrainians would be treated in a Russian Crimea have so far proved unfounded, and I hope that continues to be the case. Note: I am very much aware of what’s going on in Ukraine at the moment too, where hundreds of people have died in the fighting in the east, but feel like that’s out of the remit of my updates: they’re meant to reflect my first- and second-hand experience(s) of the changing situation in Sevastopol during the transition to becoming a full part of Russia. As I’ve said many times before, I hope the situation in Ukraine is resolved as soon as possible. 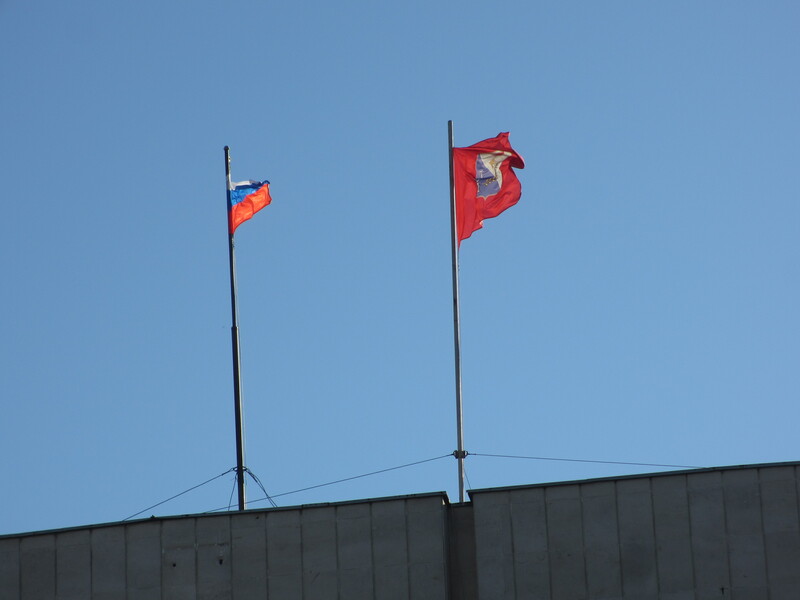 Just over two months since the Crimean referendum of 16th March 2014, and Sevastopol is rapidly becoming a fully-fledged part of the Russian Federation, in some cases much more rapidly than originally expected. On Tuesday 13th May, a week ago, in the traditional word-of-mouth way in which most news about the transition seems to be spread, I heard from two different people that the rouble would be the only currency accepted here from June 1st, 2014. This is a bit faster than originally planned – it wasn’t supposed to happen until January 1st, 2016! I haven’t seen any official announcement of this in English news sources, but having just done my first proper Google search in Russian (ever! ), it was apparently announced by the speaker of the lower house of the Russian Duma (parliament) on May 12th. 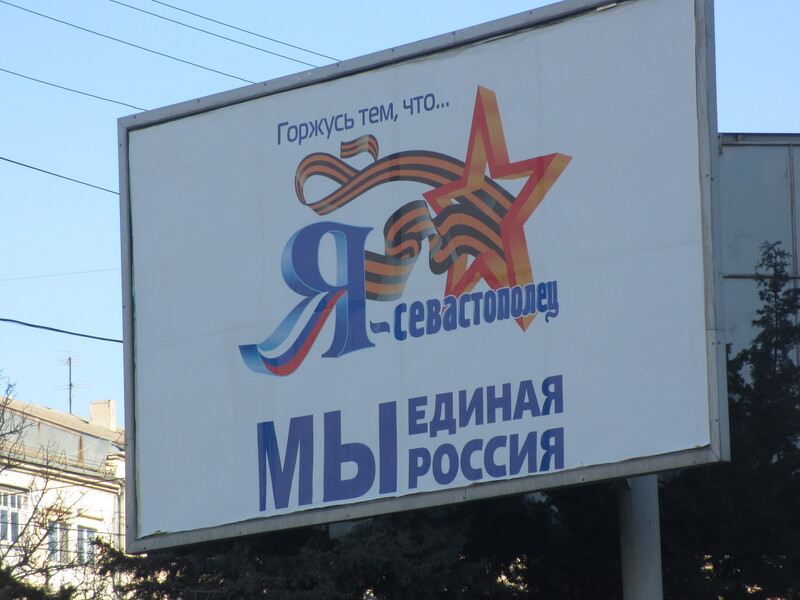 Gazeta.ua reports that there are now about 300 branches of Russian banks in Crimea, and that there are enough roubles in circulation to make the change. However, the bus drivers obviously don’t think it will be a smooth transition, as they have stated today that June 1st will also mark a change in paying for public transport: rather than paying as you get off, you’ll have to pay before you get on. This is because they don’t think everyone knows about the switch to the rouble, and they don’t think there are enough coins in circulation yet. I’ve only seen two coins so far, so I suspect they might be right! 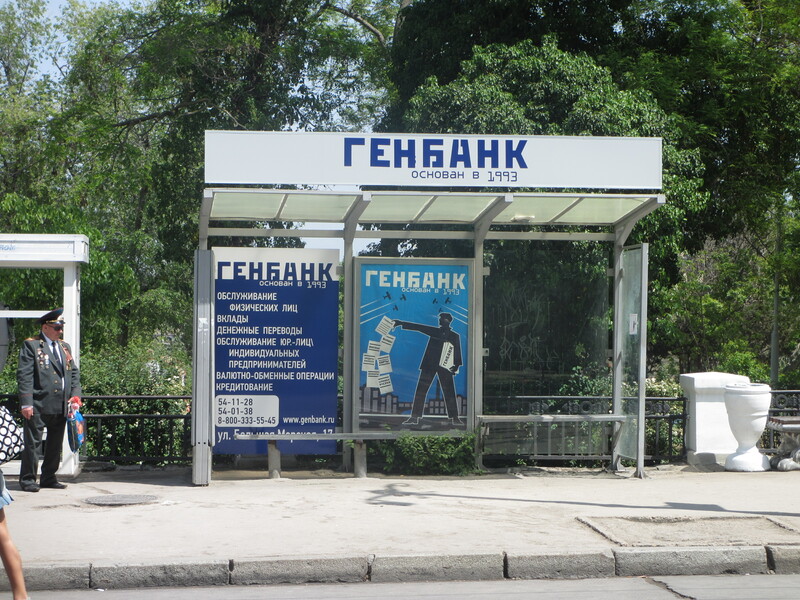 There have been no Ukrainian banks here since 7th May, which again I found out the next day when I was asked if I knew they’d closed. Luckily, I’d taken all of my money out of my account a few days before, but I know others who hadn’t, and now have to work out how to get their money back. I got my first pay in roubles a week ago, although I haven’t used them to pay for anything yet. I’ve nearly used up all of my hryvnia, and a lot of people are reluctant to take them. Everyone’s trying to get rid of them, particularly small notes and coins. I’ve seen a few people paying in roubles, but not many. Prices have been displayed in both currencies for a few weeks now, and I’ve finally got the hang of which prices are in roubles and which in hryvnia. 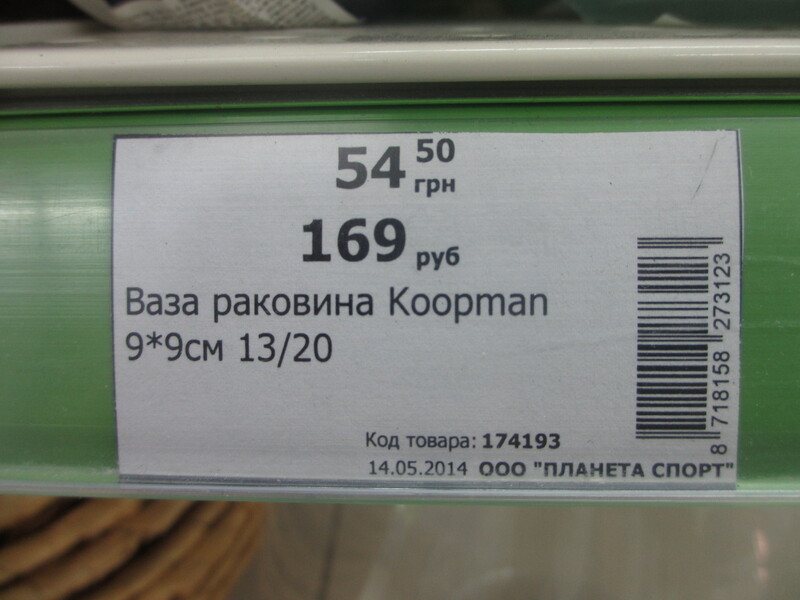 I got the bill in a restaurant a few weeks ago and was shocked at the price, then realised it was roubles, not hryvnia – as you can see, the exchange rate is about 3RUR to 1UAH, although this varies slightly in each place you go to. Some places have told me that they only take roubles, but when you argue, they always accept hryvnia. They have no choice at the moment. The financial uncertainty has meant that some shops have closed, which obviously doesn’t help because it leaves more people without money. 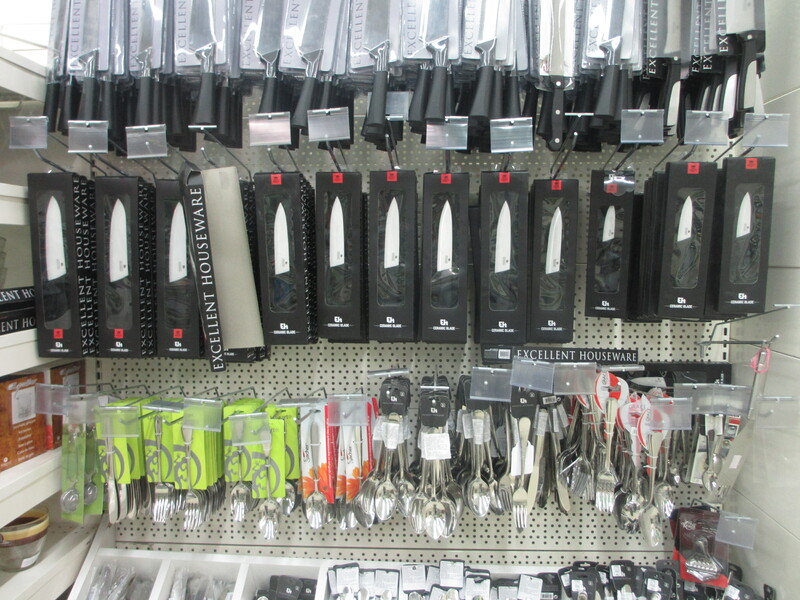 Another problem is that some supplies seem not to be getting through. It’s not a question of shortages (yet? 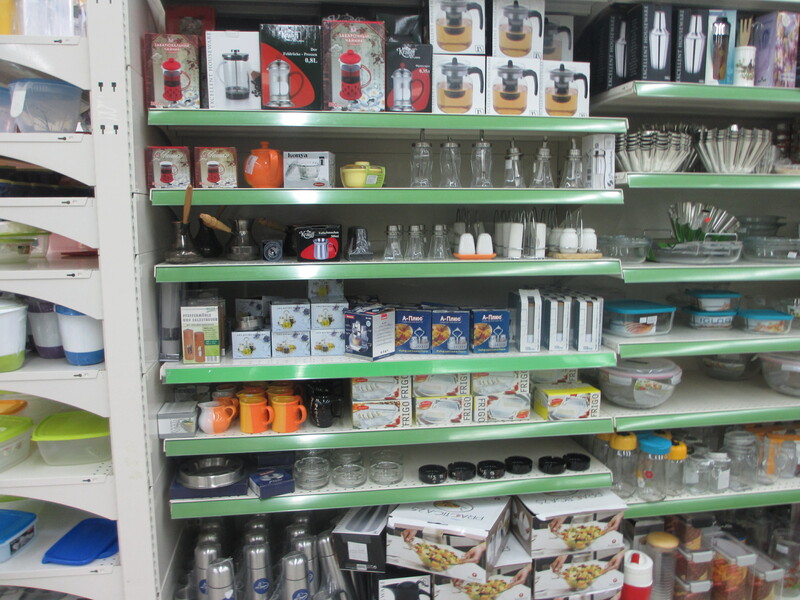 ), but there are gaps on the shelves. My local supermarket closed off about 1/10 of it’s floor area within a couple of weeks after the referendum, and their shelves were looking emptier and emptier. Something seems to have got through now though, as they were restocking when I went a couple of days ago. The local pharmacy has resorted to putting (what I think are) prescription medicines on their display shelves, in place of the normal tissues and cough sweets. Card machines are still conspicuous by their absence, although some cash machines are apparently working again. A lot of them were switched off a month or so ago, and haven’t been on since. To get around the potentially thorny issue of distributing Russian currency on what many still believe is Ukrainian soil, Sberbank have come up with the ingenious solution of putting 20 cash machines onto a ferry. The ferry counts as Russian soil, so no international laws will be broken. Post seems to be trickling through. 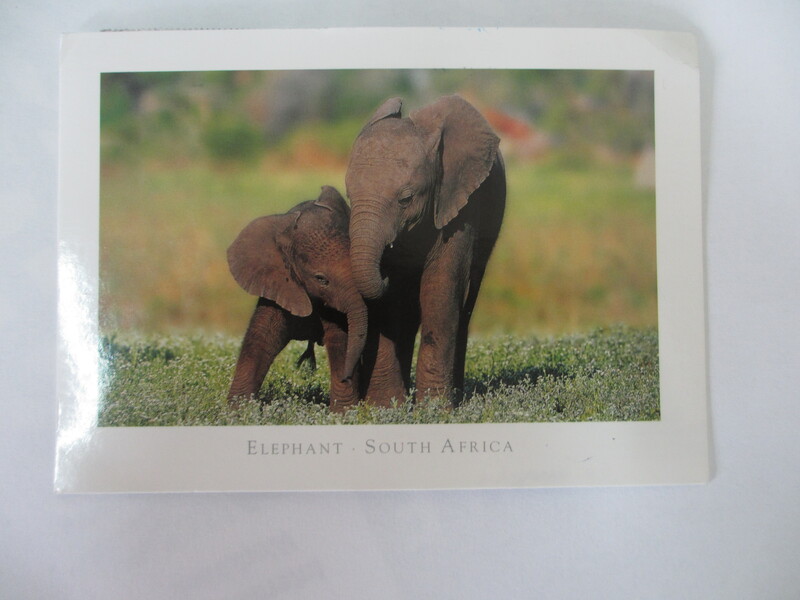 This is a postcard from South Africa which arrived a week ago, having been sent on 24th March. I don’t know if it would have taken that long normally, but 7 weeks seems like quite a long time. I went to the main post office, as I’m not sure if the small ones are working or not. The displays are mostly bare, where there used to be lots of different stamps, cards and other things you could buy, but I managed to send a parcel, covered with about 20 Russian stamps. I don’t know if/when it will ever arrive! People are continuing to apply for their Russian passports (or ‘internal’ ID – they use the same word for both here). One student told me his company arranged for someone from the passport office to come in for a couple of days so none of them would have to queue. I bet a lot of people here wished that would happen for them too – at one point people were queueing for over three hours for passports. 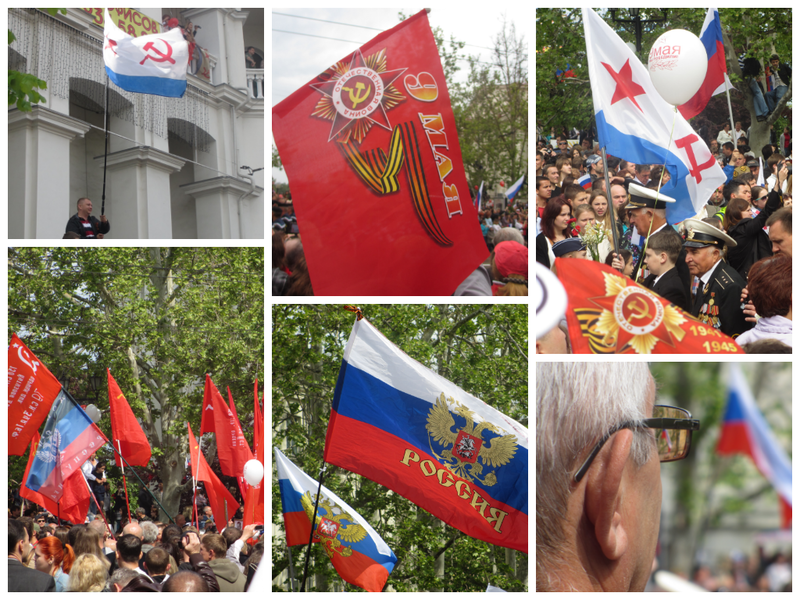 The Victory Day/9th May celebrations went off without a hitch, and talking to students since I’ve discovered that they weren’t much different to normal – there’s always a party atmosphere, it’s always a big thing, and it’s always very bombastic. The only difference this year was that it was pretty much a Russian-only affair. In the past, I was told, veterans and others have attended from Poland and the UK, among others, having fought with the Soviets in the Second World War. 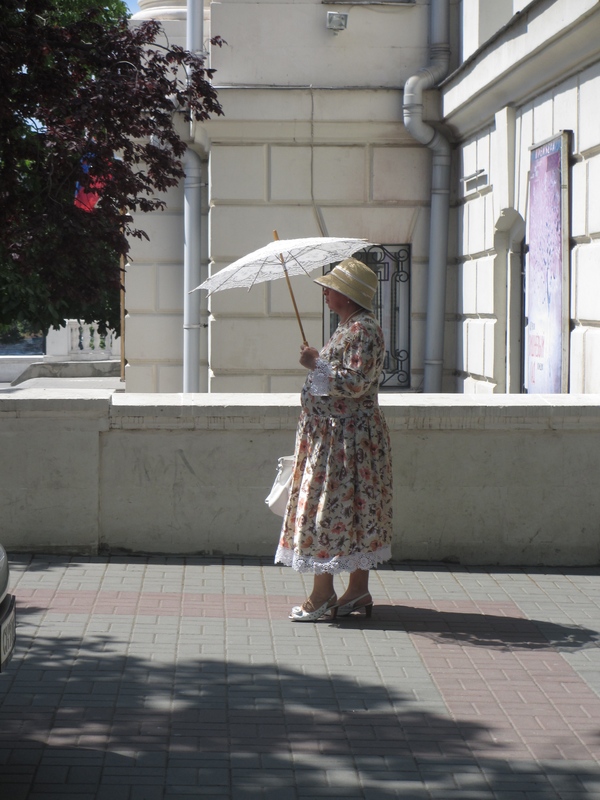 While waiting for the parade to start, an older woman started talking to my companions about why she was happy to see the Russian military in the parade. She described how her son had gone from being a Ukrainian soldier to a Russian one. In the Ukrainian army he had almost nothing supplied to him, just a uniform. He had had to buy pretty much everything else himself. At the weekends, he would eat at friends’ houses because the food they were given really wasn’t great. When he and his colleagues went to work for the Russian army, they took all of their equipment, and were amazed to discover that they didn’t need any of it – it was all supplied. 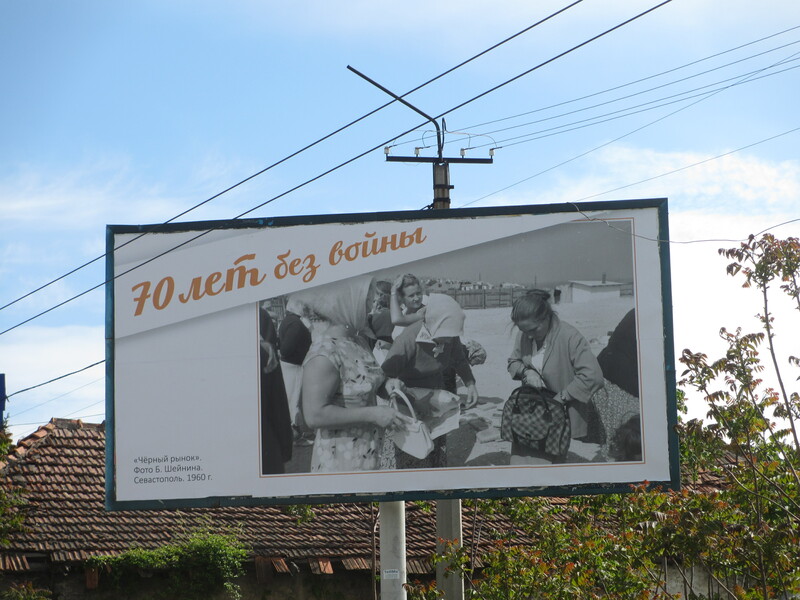 When they went into the canteen on the first day, there were tablecloths on the tables, and a good range of food. He didn’t regret changing allegiances. Another area in flux is the educational system. I was told about problems with the Sevastopol Banking Institute. The Institute was set up about five years ago in a beautiful new building funded by the National Bank of Ukraine, with the aim of training “highly qualified specialists for Banking and Finance system of Ukraine”. With the changeover to Russia, I was originally under the impression that it would be taken over by the Central Bank of Russia, although understandably this was a contentious issue considering where the funding had come from. Late last week, a group from the local council replaced the director of the institute, as he was said to be blocking this move. Teachers and students were asked to leave for the day. Nobody knows how they will finish their studies, or how degrees will be awarded. Yesterday students asked Putin to help resolve the situation at the Institute. My teenage students are particularly worried about education now, as they don’t know where they will go to study, or how much they will be handicapped by having had a largely Ukrainian education if they choose to go to Russian universities, where they will have to take the same entrance exams as those who have been through the Russian system. That’s how the situation looks after two months – some things are resolving themselves, other things are being added to the mix. It’s an interesting time to live through, and life is certainly never boring! 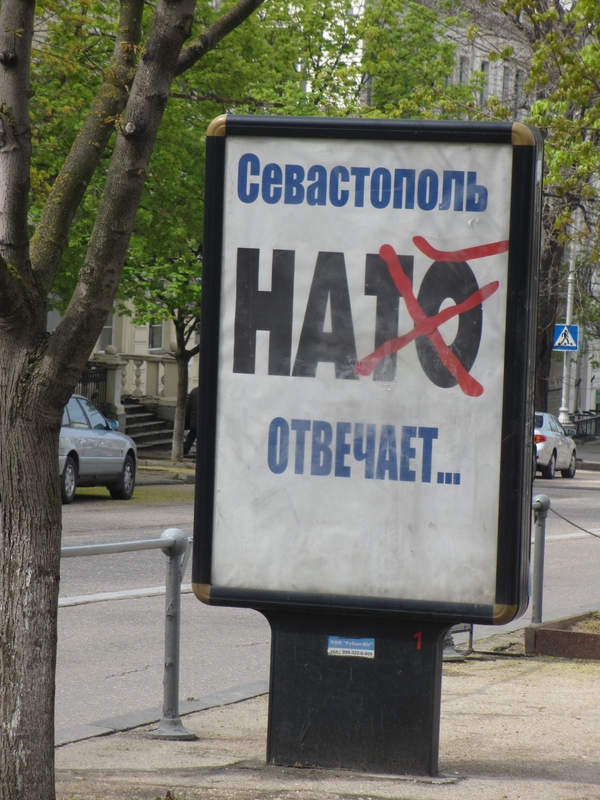 At the end of April, these stickers started to appear on public transport across the city. Then a couple of brand new trolley buses appeared on the streets. 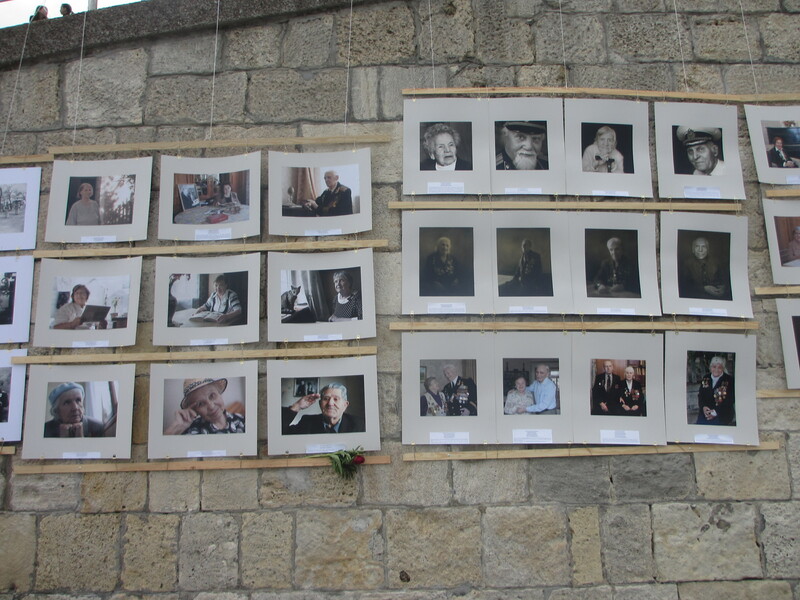 All of the advertising in the city centre was replaced with images of war veterans, accompanied by their names and a paragraph about them, every poster showcasing a different person or couple. Other posters and banners appeared too. 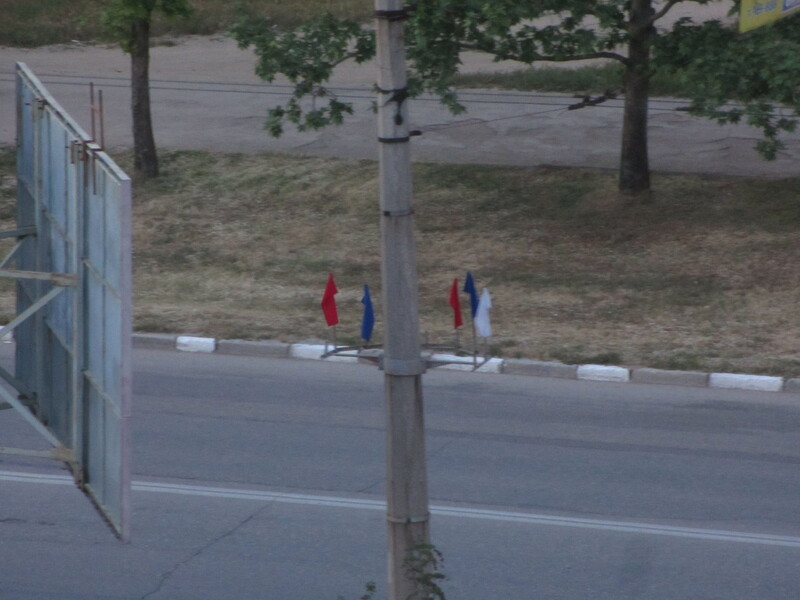 Red, white and blue flags were put on every other lamppost. The main memorial in the centre of the city was cleaned, and the trees near it were chopped back. The wood on the benches in the city centre was replaced, although not all of the old wood was taken away! Even the lines on the roads were repainted. 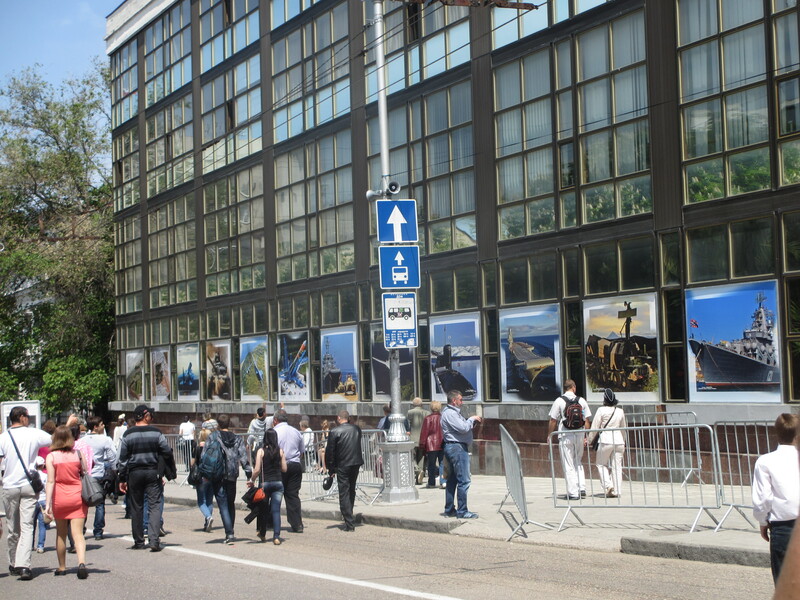 For the week leading up to 9th May the events of Victory Day were the main topic of conversation, with speculation on what exactly would happen on the big day, including whether Putin would visit. Everyone had a different idea about what time things would happen, and nobody really seemed to know exactly how the day would pan out. One thing was clear though: it would be a day that would go down in the history of the city. 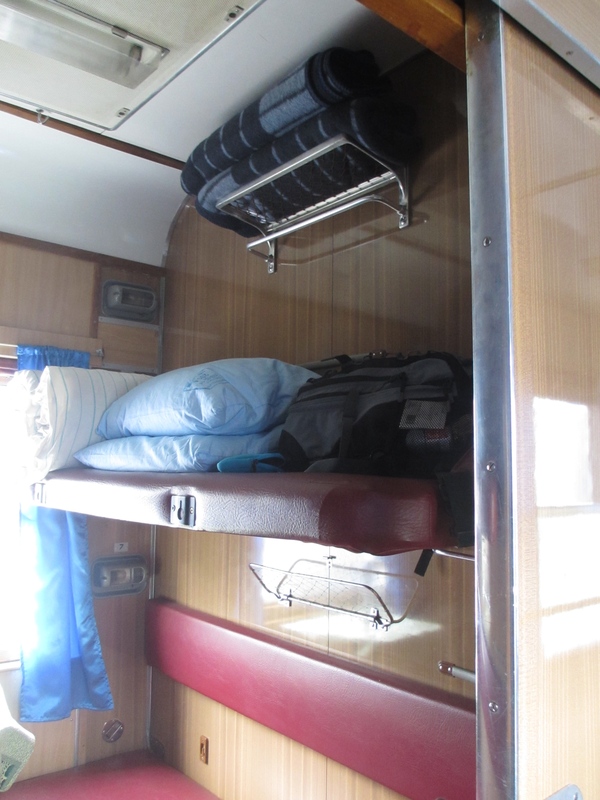 On the morning of 9th May, I left my flat early. Or at least I thought I had. When I got to my bus stop there were about 50-60 people there, with more arriving all the time, and every bus going past was so full of people it just drove by. I walked back two stops, to find the same at both of those. In the end I got the bus in the opposite direction, travelling for more than 10 stops before finding a stop with few enough people to try to get into the centre from. There was more traffic than I’ve ever seen going into the city, and almost nothing going in the opposite direction. The 20-minute journey took me nearly an hour. When I finally made it, I found a party atmosphere. 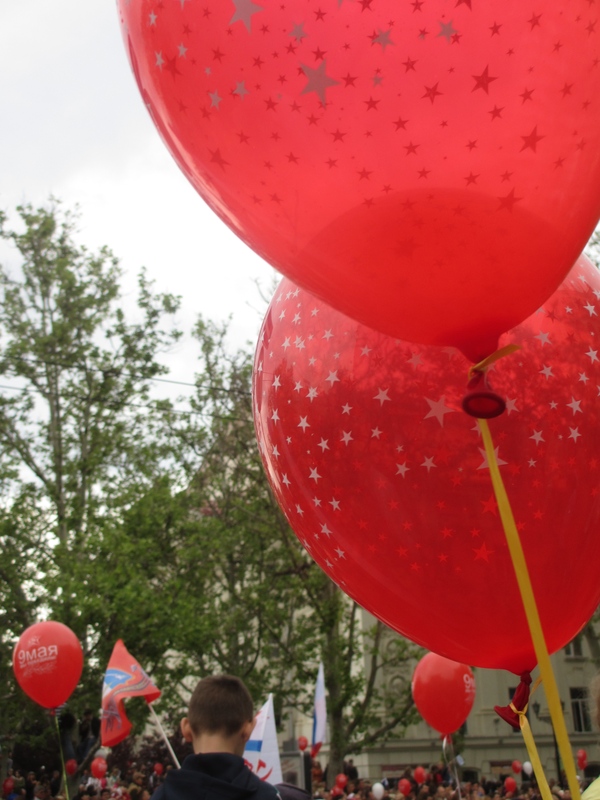 There was a buzz of excitement, and the 9th May balloons were everywhere. People were standing anywhere they thought they would get a view. 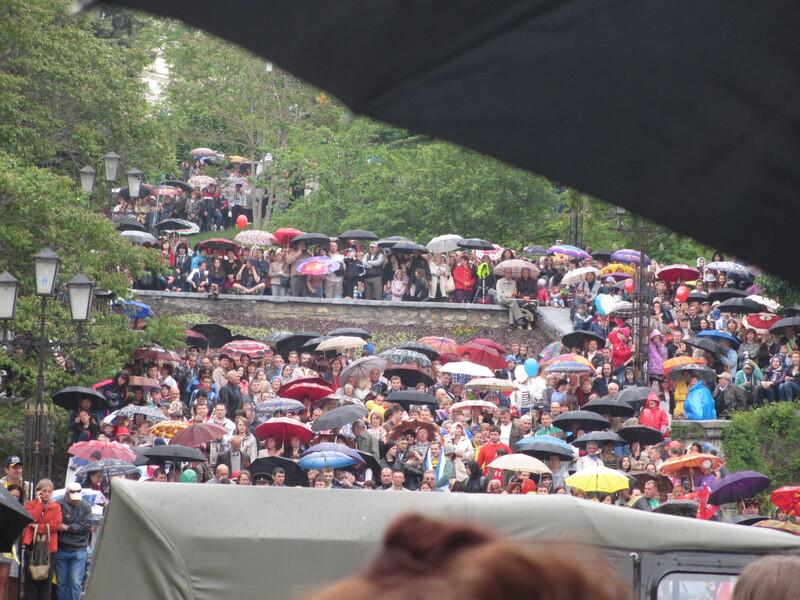 Even a downpour of rain didn’t deter them. At 10:15, we heard an announcement, and the first parade started. It was led by drummers, and consisted of cadets from the many military academies in the city. The next part of the parade was a display of military hardware. People started chanting ‘Россия, Россия’ (Russia, Russia). Then came the part of the parade everyone had been waiting for: the veterans. They came from all over Crimea, and perhaps even from further afield. Each group was led by a banner stating the unit, ship or submarine they were from. As they went past, people were chanting ‘Спасибо, Спасибо’ (Thank you, thank you). Children waited with flowers to hand them to the veterans as they passed. The veterans had huge smiles on their faces, and were grateful every time someone gave them flowers. Those who were absent were also represented in the parade. The emotion was palpable, and the veterans were clearly touched by the appreciation shown to them. 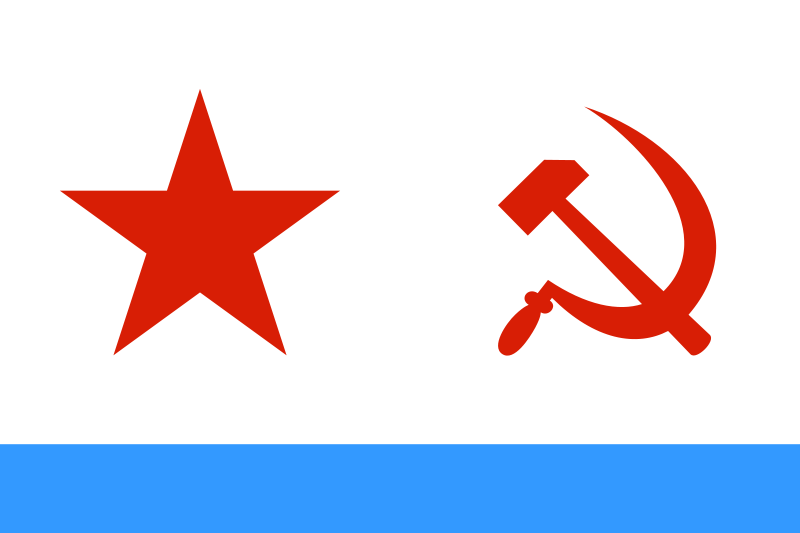 The red star and hammer and sickle is the Soviet era naval ensign, which has been superseded by a St. Andrew’s Cross (a blue cross on a white background, the opposite colours to the Scottish flag), but which is still a very popular symbol here. The black, blue and red flag represents the Donetsk People’s Republic, an area of Ukraine which is holding a referendum as I write this. 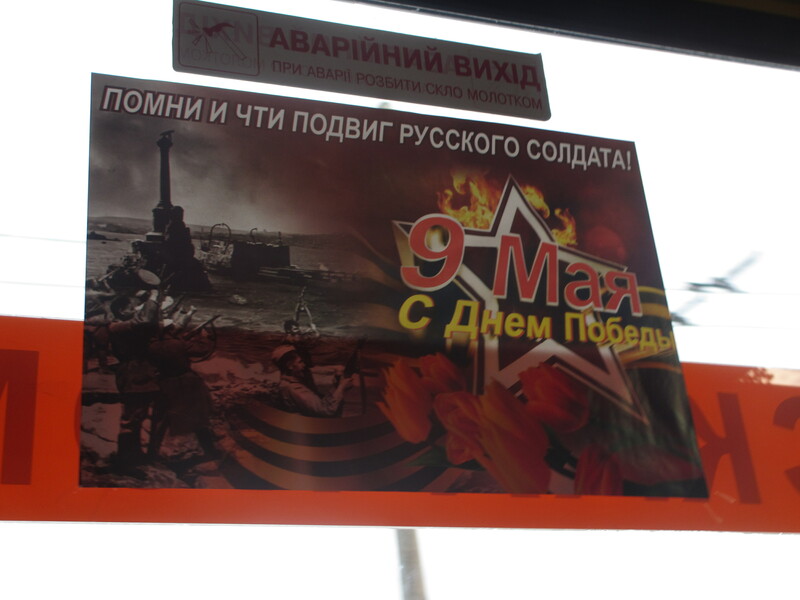 The 9th May flag shows the black and orange ribbon of St. George and the highest medal awarded to Soviet soldiers for valour in the Second World War. The ribbon was being worn by well over half of the people I saw during the day. It’s all over the city, tied to cars, bags, and even prams. After the parade finished, the streets in the city centre were still closed for a while. People were looking at old vehicles from the Second World War and posing for pictures with those who owned them. There were bands in a couple of places, with people dancing to the music. This one was next to a war memorial made from an old tank. 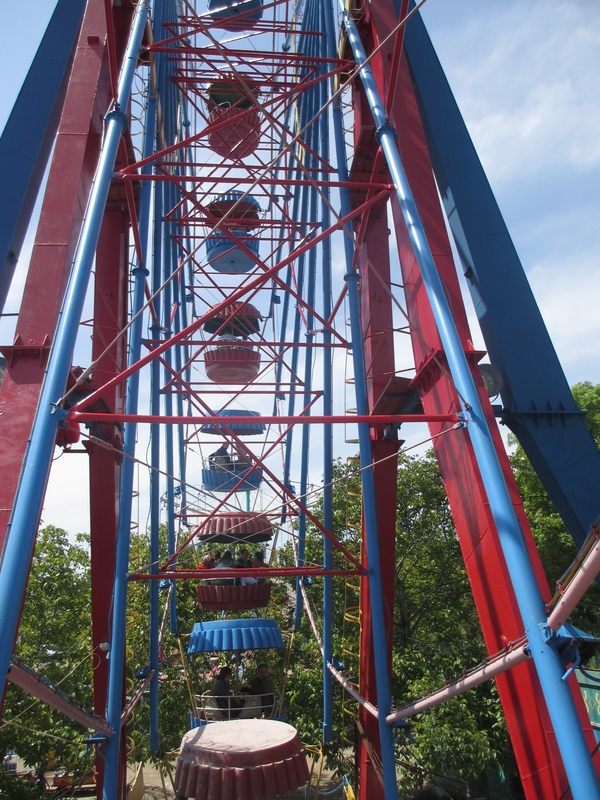 …and walked around the park, where people were having picnics. 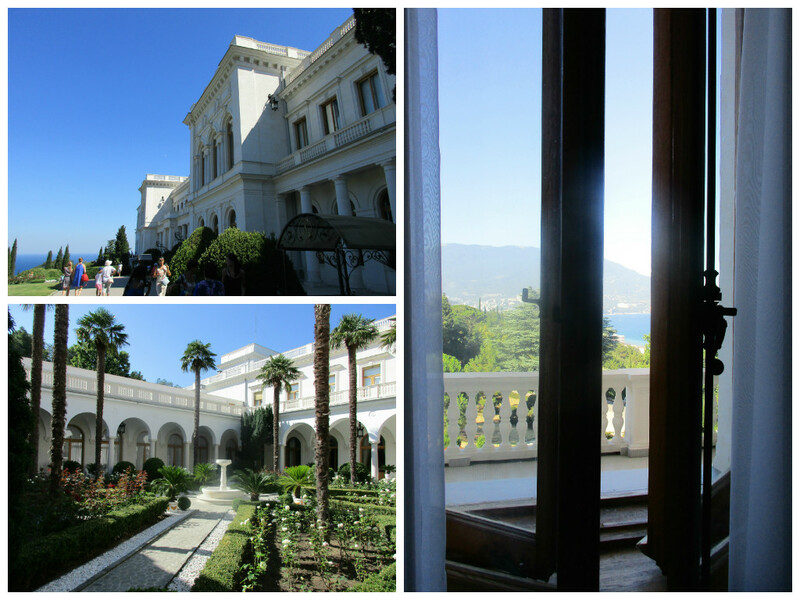 Around the city there were many other things to see too. After that I had a break for a couple of hours, during which President Vladimir Putin arrived in Sevastopol. This was the most controversial part of the day for the outside world, as reported by (for example) The New York Times, The Sydney Morning Herald, The Guardian and The Washington Post. I saw part of his speech on Russia 24 television, which had dedicated the majority of their coverage to Victory Day celebrations across the Russian-speaking world, with the only other news covered being the situation in Ukraine, mostly in Mariupol. You can read a full transcript of the speech Putin made in Sevastopol, or watch a video showing parts of the day, including the speech. He was also on the main stage in the centre of Sevastopol a little later, although I can’t find any links to the speech he made then, and people were chanting ‘Спасибо, Спасибо’ (Thank you, thank you) again. Many people in the crowd were crying, and I know from someone in the crowd that at one point Putin had to stop speaking because he was so choked up. 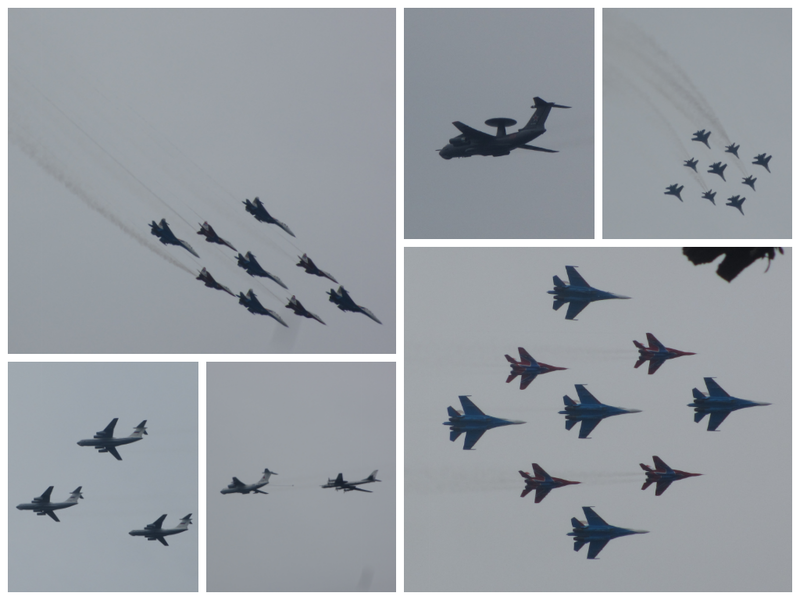 The next big event was an air show, with the highlight being a joint display by the Russian Knights (the large blue planes) and the Swifts (the smaller red planes with blue stars on the bottom), two aerobatic teams from the Russian Air Force. There were also other military planes in a flypast, and examples of planes refuelling in mid-air. 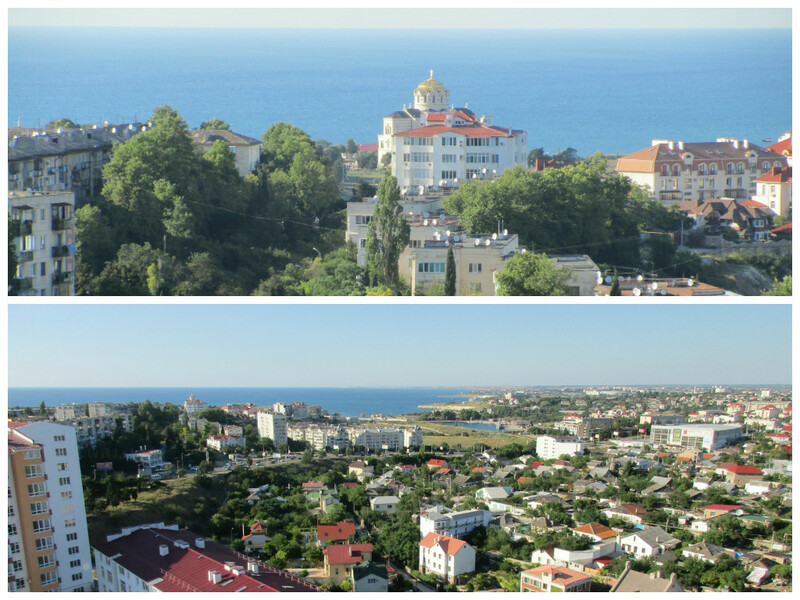 This article has a video showing the view of Sevastopol from the planes of the Russian Knights. What I didn’t realise was that it would be divided into two sections, so I was surprised later when the planes started displaying again. These photos are all from the first display. The day ended with a huge fireworks display. The ships in the bay were lit up, and the crowds were huge. To give you an indication of how much of a celebration Victory Day is here, the man in the picture below choose the beginning of the fireworks to propose to his girlfriend, and she accepted. The next day, a feeling of celebration was still very much in the air. This huge tall ship, Kruzenshtern, apparently one of the biggest sailing ships still in operation, was visiting Sevastopol for a couple of days. I didn’t go on her because the queues were hours long, but I spent a while taking photos and absorbing the atmosphere. 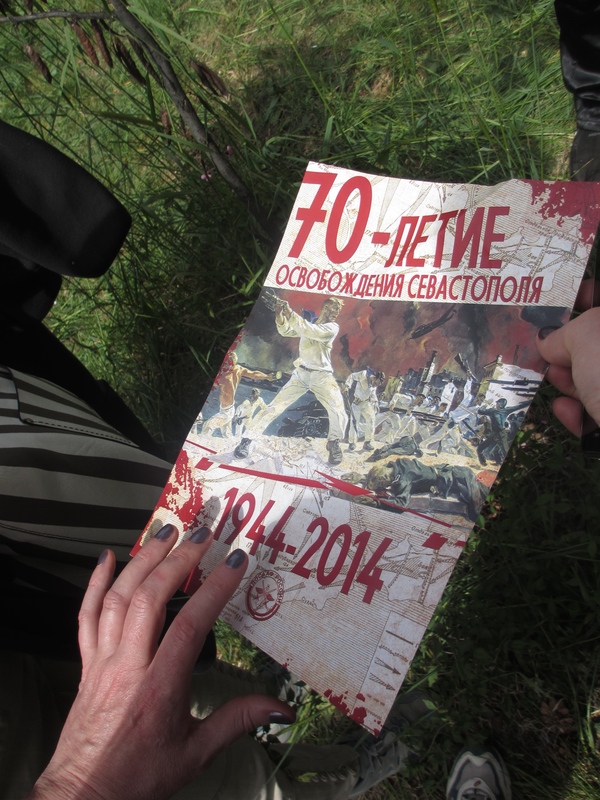 Why is Victory Day so important? Victory Day marks the capitulation of Nazi Germany to the Soviet Union at the end of the Second World War. 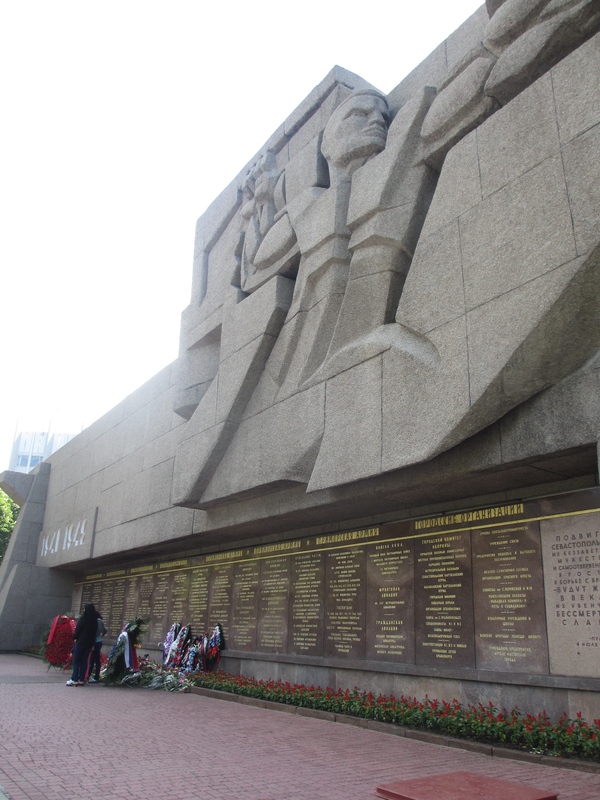 Over 20 million Soviets died during the Great Patriotic War, as it is known to Russians. My friend told me that this equates to about 13 people every minute, throughout the whole war. 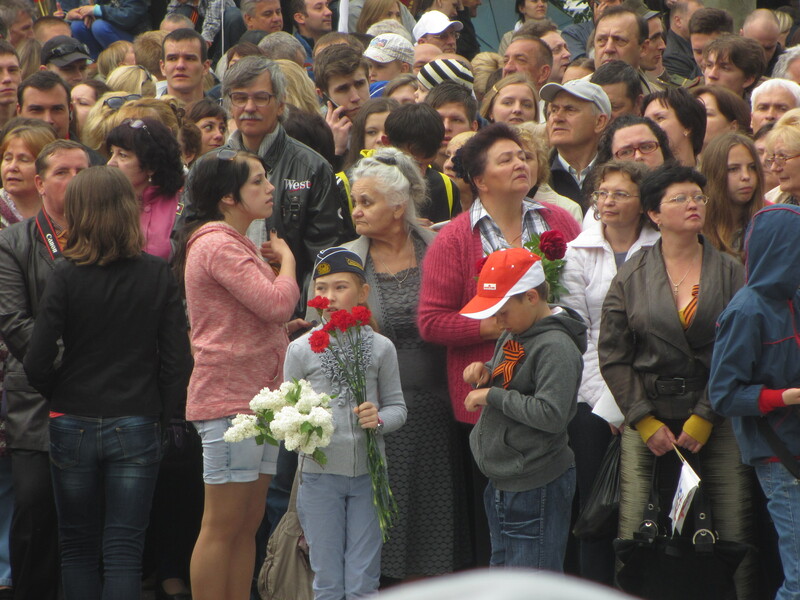 Everybody here is related to people who died, on a scale which it is difficult to comprehend as an outsider. Victory Day is Russia’s most important secular holiday and a key element of the country’s national identity, honoring the armed forces and the millions who died in World War II. I first became aware of its importance late last year, when my students started telling me about it. They were surprised that we don’t celebrate it in the UK. I was told that there would be a parade of veterans and a fireworks display. 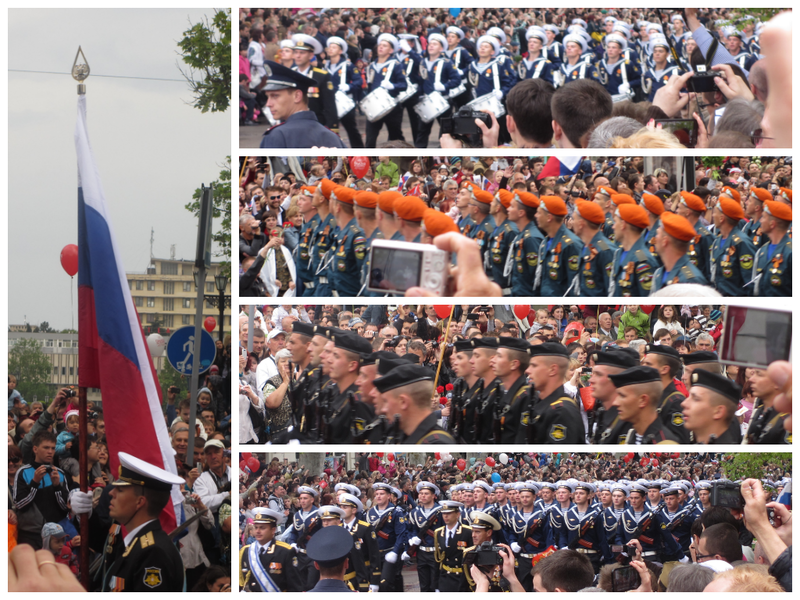 After the Crimean referendum in March, the anticipation started to increase, with people telling me that this year’s Victory Day celebrations would be bigger than ever because they would be allowed to show off more of the military. 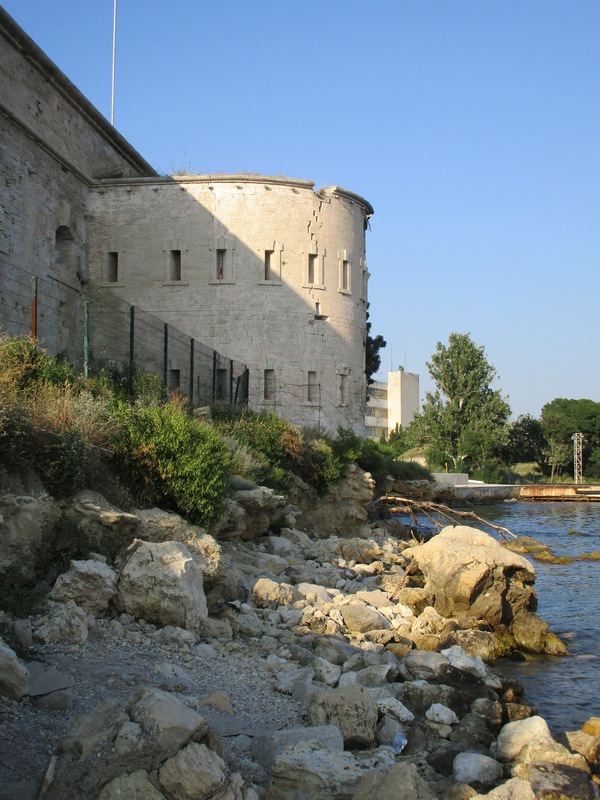 It’s 230 years since Catherine the Great ordered Grigory Potemkin to build a fort here and name it Sevastopol. 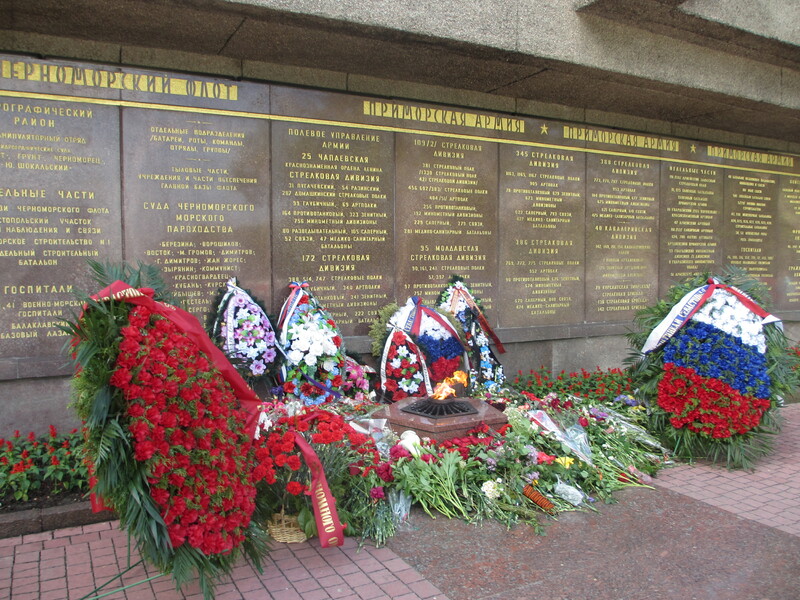 2014 also marks 70 years since the city was taken back from the Nazis after the Crimean Offensive on 9th May 1944. 7th May 1944 was the assault on Sapun-Gora, the final line of defence outside the city itself. There was a reenactment there last weekend which I also went to. 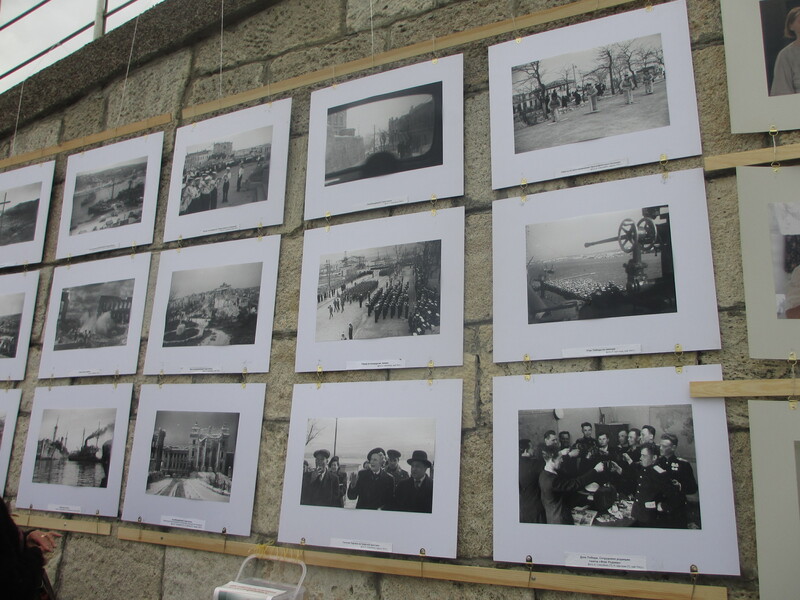 The Nazi takeover of the city in 1941-1942 and its subsequent recapturing by Soviet forces is one of the defining events in the history of Sevastopol. 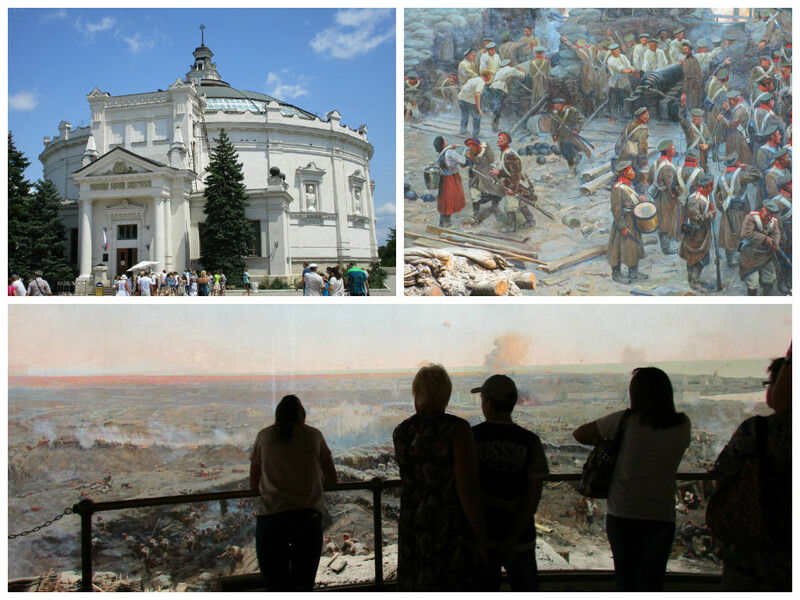 During the Siege of Sevastopol over 95% of the city was destroyed. Those who died are commemorated in a monument which dominates the main square. This is where Putin laid his wreath on Victory Day this year. 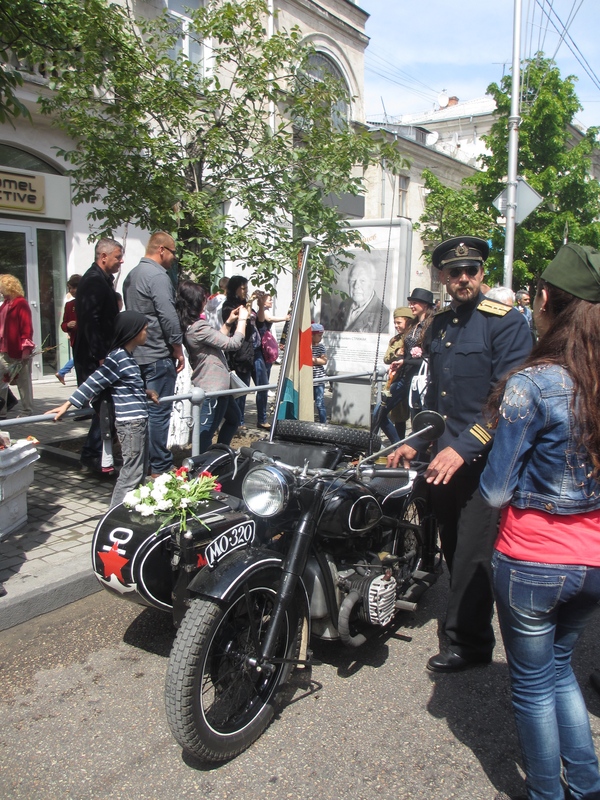 Victory Day is supposed to be about remembering the sacrifices of World War Two, but today in Sevastopol it became a party. That’s not to say that I didn’t feel conflicted at various points during the day. It’s hard not to be caught up in the atmosphere when everyone around you is cheering and excited, but it didn’t stop me feeling slightly uncomfortable during the display of military hardware, not knowing whether this was a normal part of Victory Day here, or whether it was a show of force for the outside world because of current events. 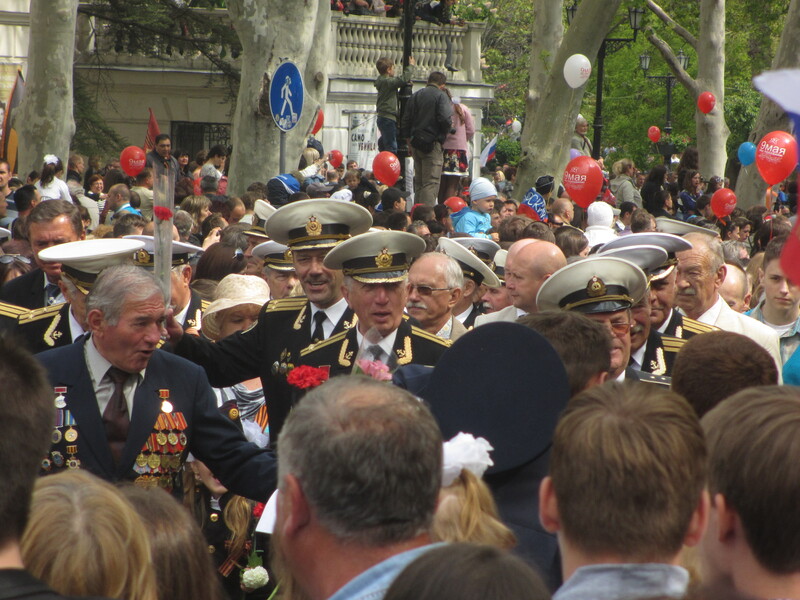 However I felt, attending Victory Day in Sevastopol was a fascinating insight into a different culture, and one which I’m glad I was able to experience. I’ve grown up in a country and a culture where I have been conditioned to mistrust Russians, through the messages that have been fed to me by popular culture. During the reenactment at Sapun-Gora I thought ‘I’m watching both of our groups of enemies’ and it felt strange, then had to remind myself that the Soviets were our allies at that point. 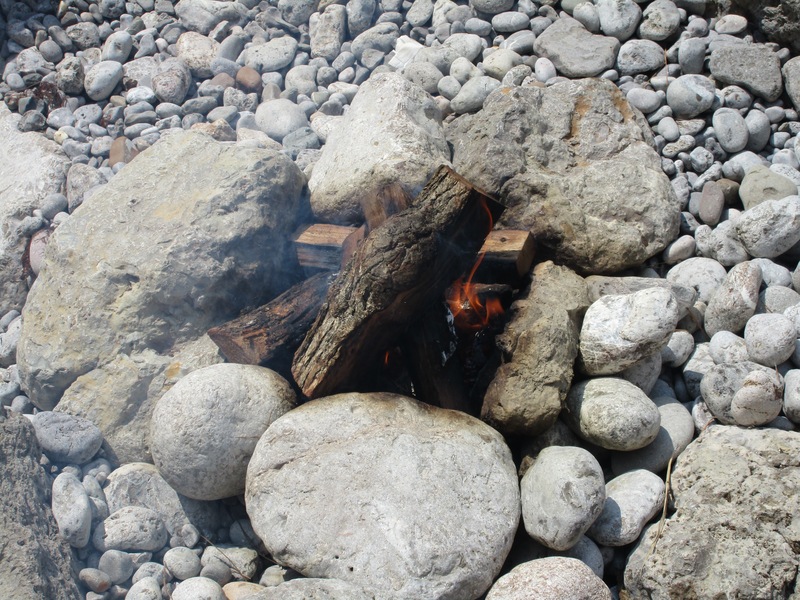 I am here, I can speak to locals, I can get an idea about what they think and feel, and even then it’s taken a long time to change my filters. After nine months in Sevastopol, I still occasionally catch myself questioning people’s motives, the people I am surrounded by and who I know are just people, like me and you. A lot of the outside world seems to tar everyone with the same brush, the brush they were taught to use by growing up in cultures like mine, where Russians are automatically the bad guys. What is happening now worries me a lot. The events in Crimea, the actions of Putin, the lack of dialogue and understanding between all sides, the division between families and friends, the rhetoric. It’s impossible to know what will happen over the next few days, weeks and months. Whatever it is, I sincerely hope that the events marked by Victory Day are never repeated, and that in the 21st century we can find other ways to resolve our differences than through violence.